Downers Grove South's Mustang Relays may have seen their 15th year of competition, but personally, this was my first glimpse of a big-league indoor track meet outside of the Prep Top Times meet at the end of March. Needless to say my first Mustang Relays was fire, and that is an understatement. During my first meet coverage experience, I was able to witness a slough of IL #1s and #2s, as well as many more IL Top Ten times. For those who have never seen the meet in person, it is truly an amazing competitive environment for a high school track athlete. The energy in the fieldhouse is electric, with fans lining every inch of the upper-level rafters. As with many indoor track events, the area is confined to an extent, which make it L-O-U-D LOUD within the walls of the facility. To me, this burst of sudden noise only adds to the experience, as athletes feed off the energy from the crowds. There is no way to describe exactly what it was like to be at that meet for the first time, and I speak from the perspective of an intern. I cannot imagine what it feels like to compete at Mustang, and unfortunately, since I am a high school senior, I will never have that opportunity. North Central College provides the event with an incredible facility to produce some fast times: and that's exactly what it did. To start off the night, I witnessed host team DGS's girls absolutely destroy the fast section of the 4x800m relay in 9:25:32- three seconds off the Mustang Relays meet record and a new IL #1. Following this phenomenal performance, I spoke with the four speechless girls who could not believe that they just won that race. This was also my first interview conducted on the other side of things: I was the interviewer, not the interviewee. Let me just say, this was an incredibly strange feeling. Answering questions immediately following tough track races is hard enough as it is, but asking the questions proved to be equally as hard. After the girls' 4x800m relays had concluded, the boys quickly proved to be just as exciting. With multiple opening legs under 1:55, it was obvious rather early that this race was about to produce some new state leaders. While DGN boys established their dominance in Illinois distance running, showing off their depth with Section 2 (8:15.39) and 3 (7:55.79) winning relay squads, they also led multiple teams under the 8:00 minute barrier. Even more impressively, a total of nine teams bested the previous IL #1 held by Danville set only a few days before. For me, this was a level of competition that I have never experienced outside of the state track meet: and I was LOVING it! 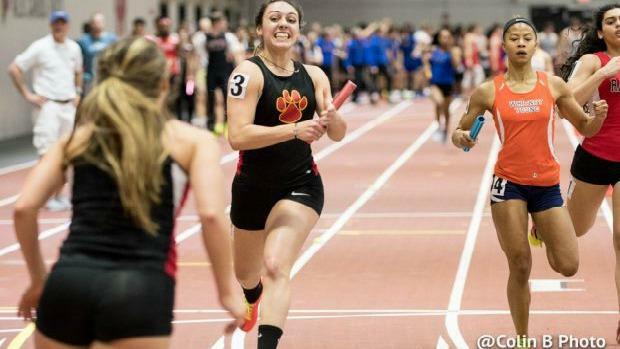 The 4x200m relays brought a shift in the overall atmosphere at NCC. The 4x800s were certainly fast in their own way, but the introduction of the next relay event came with an explosive speed that only truly talented sprinters possess. This event proved to be just as exciting still, as Batavia girls (Section 6) just barely edged out Section 4 winners West Aurora 1:46.56-1:46.58 respectively. I had the opportunity to interview both teams after their impressive and clean runs, where I chatted with Tori Ortiz, a fellow future Redbird. On the boy's side, the results were reversed. It was Section 4 winners Neuqua Valley (1:32.06-IL #2) who bested the chaotic, crash-ridden Section 6 champs Minooka (1:32.88-IL #3) for the overall victory. I have never witnessed two teams that were so ecstatic about their runs. Batavia girls immediately embraced in group hugs after Ortiz flew across the finish line, and NV boys anxiously waited through two sections before getting their chance to break out the victory dances. If you have not yet already, be sure to check out Colin B. 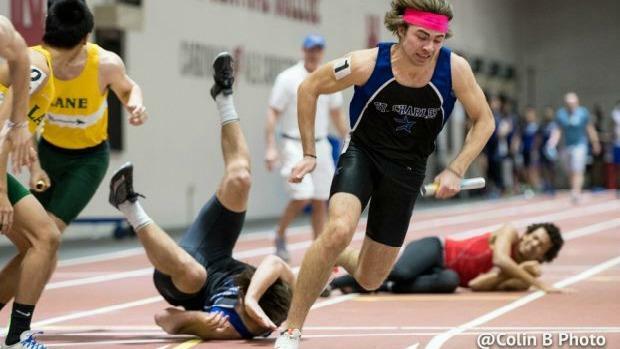 's incredible photos of these moments on the MileSplit IL website! The final event of the night again brought as much excitement and energy as the first. The balcony was still lined with crowds hungry for some more great races to cap off the night. For the girls, I again witnessed West Aurora (Section 5- 4:06.31) battle for the win, this time falling just short of the Whitney Young girls' 4:05.80 out of the final section. I conducted interviews with both teams (twice due to some technical difficulties! ), and let me just say, they are filled with personality and immense talent. Thanks to the Flyers and the Dolphins, my final interviews were filled with laughs-a perfect way to top off my first intern coverage experience. Just when I thought the night could not possibly get any better, Minooka boys managed to prove me wrong. The final section of the 4x400m relay kicked off with a 50.8 split out of Proviso East's lead off leg. The remainder of the race was just as unbelievable. 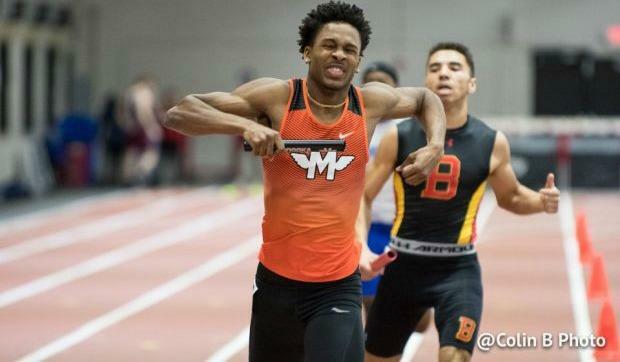 Managing to make up a large deficit, Minooka's Brandon Adams gutted out a fire 48.3 second anchor leg to run down Batavia and Proviso East. The truly remarkable thing about this was that Adams barely seemed tired afterwards, and still had enough energy for a well-deserved celebration with his relay teammates. Now, after taking the last week to reflect back on the experience, I realize how much I truly learned from it all, and how grateful I am for that. Thanks to MileSplit IL, I was able to witness truly stunning feats by some high school stars at a meet I otherwise never would have experienced. Not only that, but I was then able to speak with these amazing athletes and see what it is like on the other side of the camera. While I still have a lot to learn in the world of sports journalism, this hands-on experience has enabled me to further develop my skills and my interest in the field of study. I look forward to covering more meets with MileSplit IL this track season and continuing work with Tony the Prepster, Colin B., and a plethora of other awesome interns!